For the hill in Dumfries and Galloway, see Crown of Scotland (hill). The Crown of Scotland is carried by the Duke of Hamilton as Queen Elizabeth II leaves the Chamber, following the opening of the 4th Scottish Parliament in July 2011. In January 1540, King James V commissioned the royal goldsmith, John Mosman, to refashion the Crown of Scotland. The existing crown was delicate and had been repaired at least twice in the previous 30 years, and a 1539 inventory showed further damage, including the loss of one fleur-de-lis. Mosman dismantled the old crown and removed its stones and pearls. The crown was melted down and Mosman added 41 ounces of gold mined at Crawford Moor in Lanarkshire. Constructed of solid gold, the crown consists of a base, with four fleur-de-lis alternating with four strawberry leaves. The four arches of the crown are decorated with gold and red oak leaves. At the intersection of the arches is a golden monde, painted blue with gold stars. The monde is surmounted by a large cross decorated in gold and black enamel and pearls. The crown is encrusted with 22 gemstones, including garnets and amethysts, 20 precious stones and 68 Scottish freshwater pearls. James V ordered a purple and ermine bonnet from tailor Thomas Arthur of Edinburgh to fit inside the crown. James VII ordered the colour of the bonnet be changed to red. The bonnet had to be replaced several times, and the present bonnet was made in 1993. 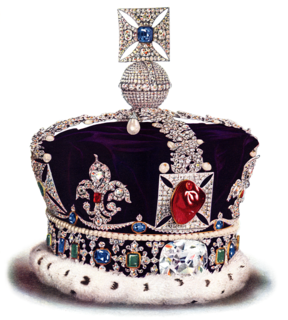 The completed crown weighs 1.64 kg (3 lb 10 oz). 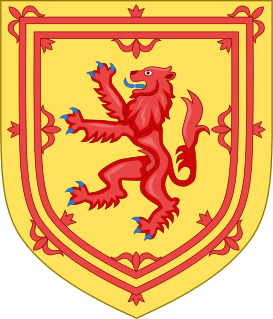 The Royal Arms of the United Kingdom used in Scotland, with the Crown of Scotland in prime position on the helm, upon the red lion sejant affronté on the crest and upon the unicorn supporter. The crown upon the golden lion supporter is St. Edward's Crown, which has been a symbol of Royal Authority throughout the Commonwealth since 1953. 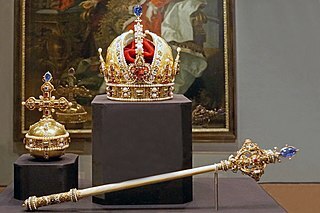 The crown was first worn by James V to the coronation of his second wife, Mary of Guise, as queen consort at Holyrood Abbey, Edinburgh, in the year of its manufacture. It was subsequently used in the coronations of the child monarchs Mary I in 1543 and James VI in 1567. 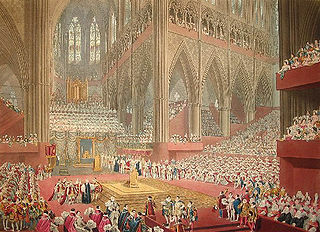 In the absence of a resident Scottish monarch following the Union of the Crowns in 1603, when James VI inherited the throne of England and moved his Royal Household from Edinburgh to London, the Honours were carried to sittings of the Parliament of Scotland to symbolise the sovereign's presence and the Royal Assent to legislation. The crown was used for the Scottish coronation of both Charles I in 1633 and Charles II in 1651. However, no subsequent Scottish monarchs were crowned with the crown. During the Civil War, having already destroyed the ancient English Crown Jewels, Oliver Cromwell sought to destroy the Scottish Crown Jewels. 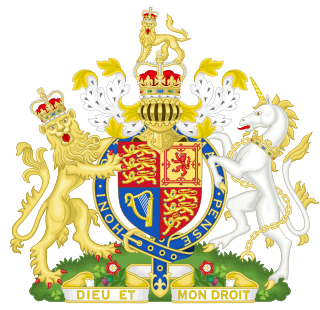 However, the Honours were secretly buried until the monarchy was restored in 1660. Following the Act of Union of 1707, which unified the Kingdom of Scotland and the Kingdom of England to form the Kingdom of Great Britain, and having no ceremonial role to play in the proceedings of the new Parliament of Great Britain in London, the Honours were locked away in Edinburgh Castle. There they remained all but forgotten in a chest until 1818, when a group of people including Sir Walter Scott set out to find them. Since 1819 they have been on display in the Crown Room of Edinburgh Castle from where they are removed only for state occasions. 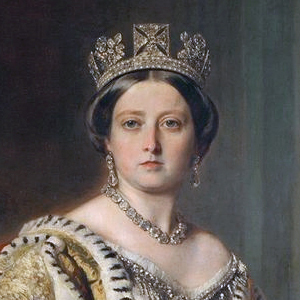 The first was when presented to King George IV, at the Palace of Holyroodhouse in 1822, during his visit to Scotland (the first visit to Scotland by a reigning monarch since 1651). On 24 June 1953, following her coronation at Westminster Abbey, the crown was carried before Queen Elizabeth II in a procession from the Palace of Holyroodhouse to the High Kirk of St Giles, Edinburgh, where the Honours of Scotland, including the crown, were presented to The Queen during a National Service of Thanksgiving. More recently, the crown has been present at the official opening ceremonies of sessions of the Scottish Parliament, including the first in 1999 and the official opening of the new Scottish Parliament Building in 2004. On such occasions the crown, carried by the Duke of Hamilton, the hereditary bearer of the Crown of Scotland, immediately precedes Her Majesty The Queen in the custom of the ancient opening ceremonial procession known as the Riding of Parliament. As well as appearing in Scottish versions of the Royal Cypher and Royal Coat of Arms, including the version of the arms used by the Scotland Office, stylised versions of the crown appear upon the badges of the Royal Regiment of Scotland, The Royal British Legion Scotland, the Scottish Ambulance Service, Police Scotland and upon the logos of the Crown Office and Procurator Fiscal Service, RCAHMS, and General Register Office for Scotland. A version of the crown is used upon Royal Mail premises, vehicles and Scottish pillar and wall boxes. From 1927 until its abolition in 1975, the arms of Kincardineshire County Council featured the crown, together with the sword and sceptre, above an artist's rendering of Dunnottar Castle, to mark the county's status as the 17th century hiding place of the Honours of Scotland during the Wars of the Three Kingdoms.